Woody Allen famously quipped that 80 percent of success is showing up. If your life is ruled by appointments, then you need a good calendaring program like Apple’s iCal. On the other hand, the big problem for some people isn’t showing up—it’s getting things done. If you’re one of these folks, your life is ruled by deadlines, and meeting those deadlines involves juggling many projects and priorities. While the calendar-oriented person can’t be in two places at once, the task-oriented person could well be working on three (or 13) projects simultaneously. For the task-oriented person, 80 percent of success is managing competing demands on time, and you may need more power and flexibility than iCal’s to-do list provides. And then there is a third group of people whose obligations are fairly balanced between an overwhelming welter of tasks (with or without deadlines) and a never-ending list of appointments. These poor folks need all the help they can get. These apps tend to fall into one of three categories: calendars, task managers, or hybrids. Six of the nine programs are heavy on calendar features and lighter on task management. Four of those six are Mac desktop applications (iCal, SOHO Organizer, Now Up-to-Date, and Sunbird); the other two are online calendar programs. One of the nine programs (What ToDo) is mainly a project- and taskmanagement tool with few calendar features. Finally, two programs—Daylite and Contactizer Pro—try to do everything: organize calendars, manage projects and tasks, and much more. Be aware that while we reviewed the latest versions of these applications, some of them are updated frequently, and the versions reviewed here might have been updated since we went to press. iCal is all about intelligent and attractive presentations. The Day view nicely accommodates multiple concurrent events. The Week view shows you all your appointments and deadlines in easy-to-read, color-coded blocks. Comparing these programs is a bit tricky, because they are all pretty good and each serves a somewhat different set of needs. 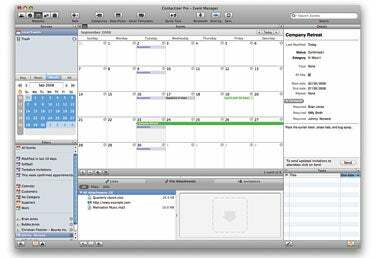 Let’s take Apple’s iCal as a starting point, since it’s free from the maker of Mac OS, and it’s an excellent program. The question is, do you need anything other than iCal? The answer may indeed be yes. While all of these programs are great for individuals, three of them (Daylite, Now Up-to-Date, and Contactizer Pro) are designed for multiple users and really shine in collaborative environments. Apple’s iCal is very easy to use and yet remarkably versatile. You can create as many calendars as you like. You can ask iCal to notify you before an event occurs via e-mail or a pop-up alert. If you want to invite a couple of colleagues to a meeting, iCal can automatically get their e-mail addresses from OS X’s Address Book; also, the invitees will automatically have access to any documents you attach to an event. You can easily sync iCal with your iPhone or iPod. You can also share calendars easily on a peer-to-peer network or even by putting your calendar on a calendar server. While you can sync your calendar to your MobileMe account, at press time the service did not support syncing events in calendars you’ve subscribed to or published. In Leopard, you can even create iCal events and tasks while you are using Mail, and Mail’s data detectors will help you pull appointment information from an incoming message. In short, iCal does most of what you’d want a calendar to do. SOHO Organizer’s interface is soothingly familiar, yet it is much more powerful than iCal’s. For example, you can create new tabs showing widely separated months, and switch between each view with a click. Or maybe not. SOHO Organizer’s creators felt that they could ask a calendar to do even more. As a calendar, its advantages over iCal may seem minor. SOHO Organizer provides some customized printing options that iCal lacks. 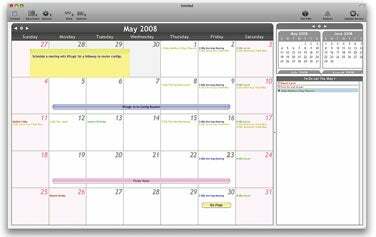 The calendar in SOHO Organizer supports a variety of international calendar types; in addition to the standard Gregorian calendar, SOHO Organizer also supports Buddhist, Hebrew, and Islamic calendar formats. And SOHO Organizer’s calendar has more display options than iCal has. But you have to step outside the calendar grid to see the most compelling advantages of SOHO Organizer. 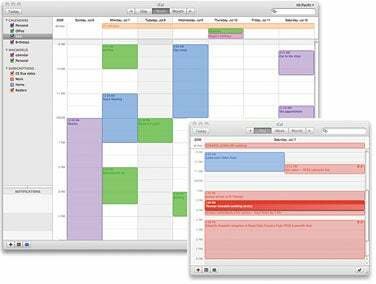 In an office environment, both iCal and SOHO Organizer calendars can be shared among users, but SOHO Organizer has been designed with more thought to multiuser access. SOHO Organizer’s strength lies principally in the interoperability of its calendar, address book, and SOHO Notes. The SOHO Organizer contacts screen lets you see all events (appointments and tasks) associated with a particular contact, although in iCal you can quickly search the calendar by attendee name to get a similar result. But the real power of SOHO Organizer is the way it works with SOHO Notes. SOHO Organizer provides two ways to write lengthy, free-form memos tied to specific days: the daily journal and daily notes. It seems like one or the other of these could be jettisoned, but Chronos seems to expect that you’ll record things like your expenses in the daily notes, and use the journal for more expansive entries. If you’re a note-writing kind of person, then the SOHO Organizer suite might be just your thing. If you’re looking for a calendar that’s both multiuser and cross-platform, check out Now Software’s Now Up-to-Date & Contact, two programs that come as a package. Now Up-to-Date & Contact is basically a souped-up combination of Apple’s Address Book and iCal that you can easily share on a network. Unfortunately, Now Up-to-Date & Contact is showing its age. Now Software has been working on a replacement called Nighthawk, which is still in beta at this writing. Daylite cuts through the clutter with an organizer that combines the power of several programs into one tool. Another homely but capable calendar comes from the open-source folks at Mozilla. Sunbird is pretty basic, and on the Mac, most folks will probably be happier with iCal or another choice. Sunbird can’t connect with other Mac programs and services such as Address Book or MobileMe. Sunbird’s notifications are limited to on-screen pop-ups, and you can only set one. But Sunbird has one nice trick. It supports add-ons, and if you install the free Provider For Google Calendar add-on, you’ll be able to get to your Google calendar from Sunbird, and vice versa; you can then manage your calendars equally well from any location. Also, like iCal, Sunbird is free. If you don’t want—or can’t afford—to be tied to a single operating system or computer, then you can access similar calendar and organizer functions via your browser with Google and Yahoo calendars. These are most similar to the calendars in iCal, SOHO Organizer, and Sunbird. Both of these online calendars allow you to create multiple calendars, invite guests, and receive notifications. For people who work on multiple machines, the ability to access your e-mail and calendar from any Internet-connected device makes the online services irresistible. Yahoo’s calendar includes a basic to-do list and notetaking feature not found in Google’s calendar. Nonetheless, I prefer Google Calendar because I use Google Gmail for my e-mail. Gmail can often recognize that an e-mail message is suggesting an appointment and will offer a quick way to create an event in your calendar. iCal can do something similar, but in iCal you have to hold your mouse over that text. 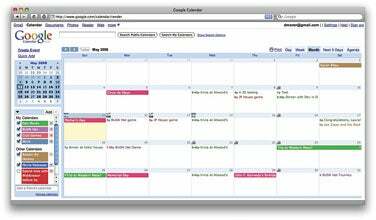 Google Calendar lets you manage multiple color-coded calendars directly from your browser. Gmail’s feature is a bit smarter. I sent myself a test message, inviting myself to a meeting tomorrow, perhaps at 12:30, but suggesting next Monday as an alternative, at 9:30 at the Starbucks in Casa Linda Plaza. Mail’s data detectors recognized meeting tomorrow if I held the cursor over that pair of words, but didn’t pick up the time later in the sentence. Gmail, on the other hand, without prompting, suggested creating an event. The event I created with a single click missed meeting tomorrow and went instead for next Monday, but did effortlessly pick up the time and the location. (Yahoo Mail has no similar feature.) Google Calendar also can send an SMS (text) message to my cell phone to notify me of upcoming events. With the exception of Google’s calendar, all of the programs mentioned so far have a limited to-do–list or task-list feature. You can enter a task, assign it to a calendar, give it a priority level, and check it off when it’s done, but that’s about it. If you have more-complicated obligations to manage, you need a more flexible tool. What ToDo is a nifty project and task organizer that’s designed along the lines of best-selling author David Allen’s Getting Things Done (GTD) books. What ToDo tracks tasks, projects, and contexts—broad classifications under which you can group tasks, such as e-mails to send or phone calls to make. What ToDo also allows you to group tasks (items) within projects, organize them, give them priorities and due dates, and add notes. What ToDo isn’t specifically a calendar application, although it shows a mini-calendar in its Detail drawer that you can use to assign deadline dates. It isn’t iCal-aware, and a task with a deadline won’t automatically appear in your iCal calendar. For individual users, the program’s simplicity may well be a plus. And aside from the lack of integration with iCal, it has a very nice Mac OS X user interface. One particular weakness of What ToDo is printing—What ToDo has no special report layouts. Individual users may find that What ToDo works very well as a complement to iCal. Now Upto-Date & Contact offers excellent cross-platform, multiuser calendaring and contact management. If you need more power in both the calendar and task-management areas than you can get from, say, iCal and What ToDo, don’t despair. A couple of tools can help you get comprehensively organized. But be warned: you might need help with the tools themselves. The programs in the do-it-all category, Objective Decision’s Contactizer Pro and Marketcircle’s Daylite, are Mac-only. Contactizer Pro’s interface has a brushed-metal effect with a sleek, modernistic feel; by comparison, the large, colorful icons in Daylite seem old-fashioned. Looks aside, both programs are loaded with features. 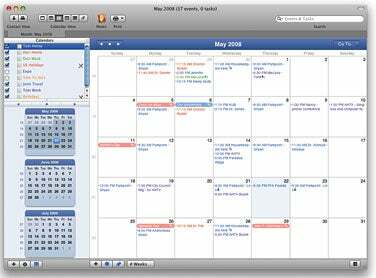 Both manage calendars; track e-mail, projects, and associated tasks; sync data with a variety of programs like iCal, Apple Mail, and more; cooperate with programs like iChat and Skype; print reports in a variety of formats; and much more. Contactizer Pro’s design seems more conventional: it tracks contacts (people), projects, tasks, and communications, and the links between these entities seem natural. Contactizer Pro is the easier of the two to learn without consulting the manual—which is lucky for users, since there is no manual. Contactizer Pro takes a peer-to-peer approach to sharing data between users: there’s no server, something that Objective Decision touts as an advantage. Technically, it may be an advantage for a three-person shop. But for larger workgroups, Daylite’s client-server approach is probably more efficient. Daylite’s approach to linking data is more free-form and takes some getting used to, and it definitely has some quirks. If you create a new task while you’re looking at the Notes screen, when you then click on OK and save your task, you won’t see it automatically. You have to switch to the Tasks view and select the My Tasks item in the Tasks index pane. This may be disconcerting for novices. Daylite’s calendaring module seems weaker than Contactizer Pro’s; you can’t, for example, duplicate an appointment in Daylite by option-dragging it to another day, the way you can in Contactizer Pro, iCal, or Now Up-to-Date & Contact. In other respects, Daylite has an even richer feature set than Contactizer Pro, and it is amazingly configurable. 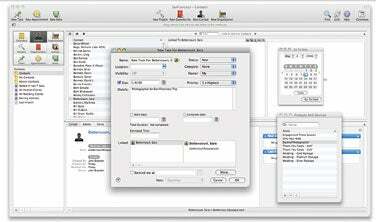 Using a contact as a filter, Contactizer Pro lets you see only those events associated with that particular contact. Daylite comes with excellent documentation, as well as instructive sample databases that show how the program can be set up to suit the needs of different kinds of businesses—a law office, for example. One thing I especially liked about Daylite, or would if I were a boss trying to run a tight ship, is that it lets you define customized pipelines. A pipeline is something like a series of steps that are normally followed as a project progresses from start to finish. For example, a wedding photographer might first need to meet with the bride, then send the contract, and so on. Daylite also tracks opportunities as a special entity. Both Daylite and Contactizer Pro are really multiuser business applications. Getting the most out of them is going to take some effort. But if you need the features and are willing to commit to the learning curve, either program would be suitable for a busy independent consultant or freelancer.